Ralph Holden's model South Australian Railways - Eyre Peninsula Division has righly attained almost cult status as a superb tribute to the Cummins - Kapinnie section of the Port Lincoln Division in the 1962-76 period. Ralph models to a scale of 3/8 inch to the foot on O gauge track, but this of course has meant that everything has had to be scratchbuilt. 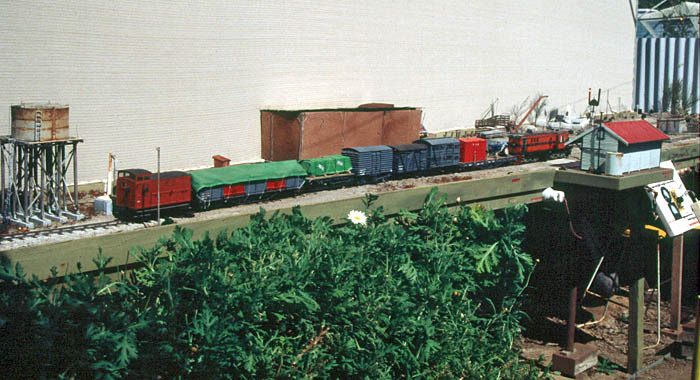 He began construction at Cummins in the mid 1960s, with proper layouts taking shape in Minlaton (1968-73), Plympton (1974-78) and Cheltenham (1989 onwards). 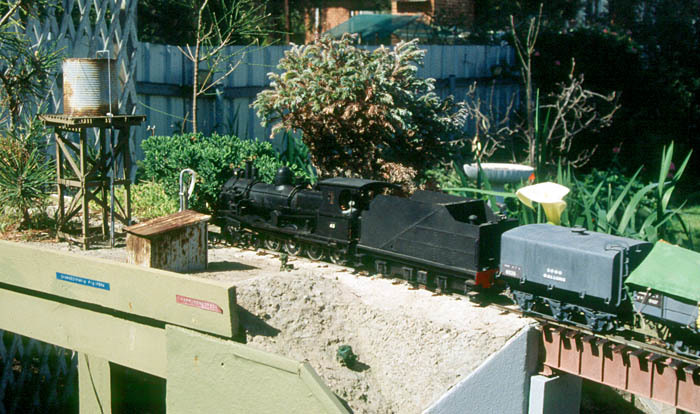 The various incarnations of the SAR-EPD have been described in the Australian Model Railway Magazine in the issues of Sep/Oct 1967, Mar/Apr 1969, Jan/Feb 1972, Apr 1993 and Oct 1997. The Cheltenham incarnation of the SAR-EPD has now succumbed to the passage of time and the elements. 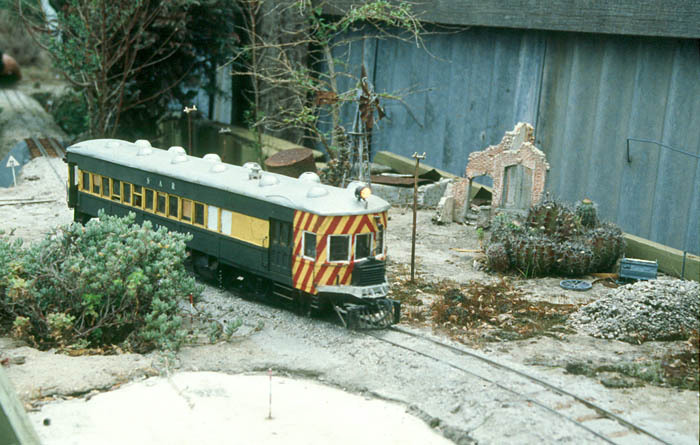 On 15 January 2009 a series of 'last trains' were run on the layout as it currently exists. A major rebuild of much of the outdoor sections of the railway is now under way, and Ralph hopes to have a revitalised SAR-EPD operational again by the end of 2009. 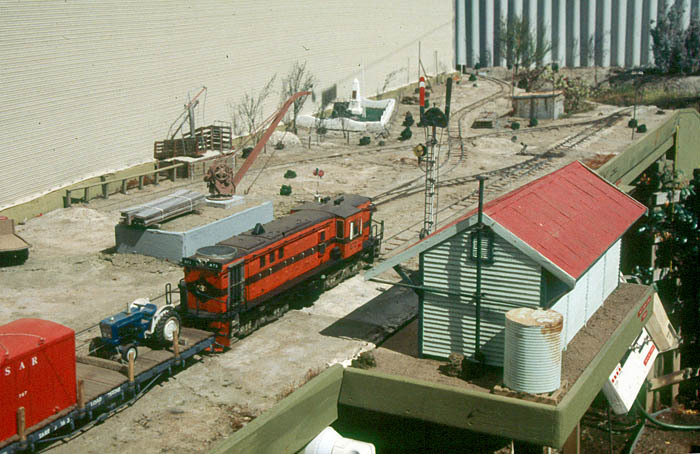 As a salute to Ralph's remarkable modelling efforts, these photographs show some of the scenes on the SAR-EPD which are now history. All photos taken by Peter Knife in September 1997 and September 1999. Above: 872 rolls through Yeelanna yard. The Kapinnie branch disappears around the corner of the garage in the background. 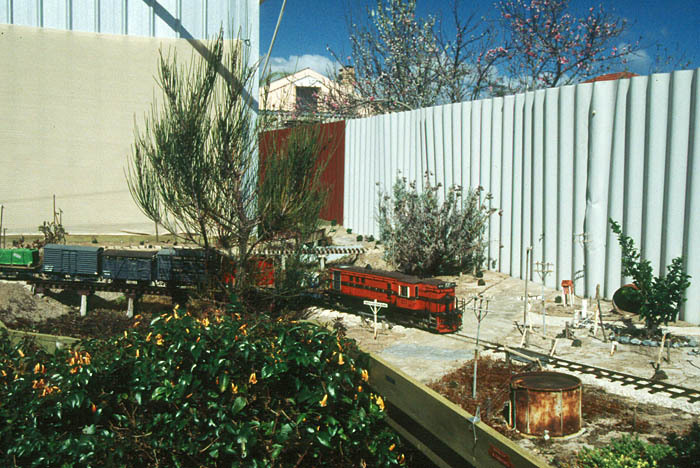 Note the attention to detail in the structures in the station yard, all of which are modelled on Eyre Peninsula prototypes. 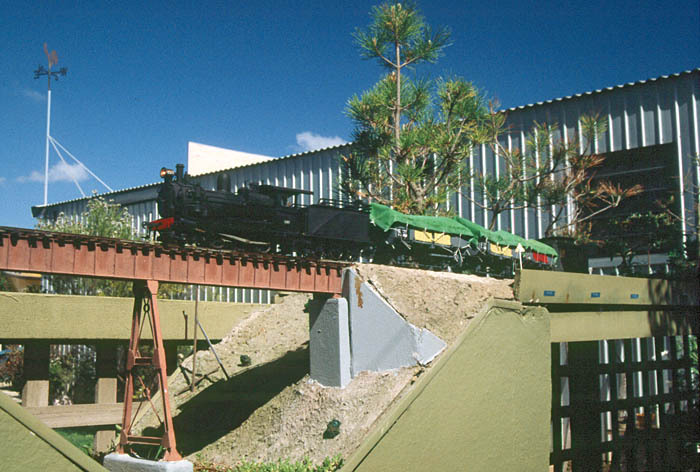 This station scene is to go as part of the rebuilding work. Above: 872 is rounding the curve over Salt Creek and approaching 'Annaleey' farm. 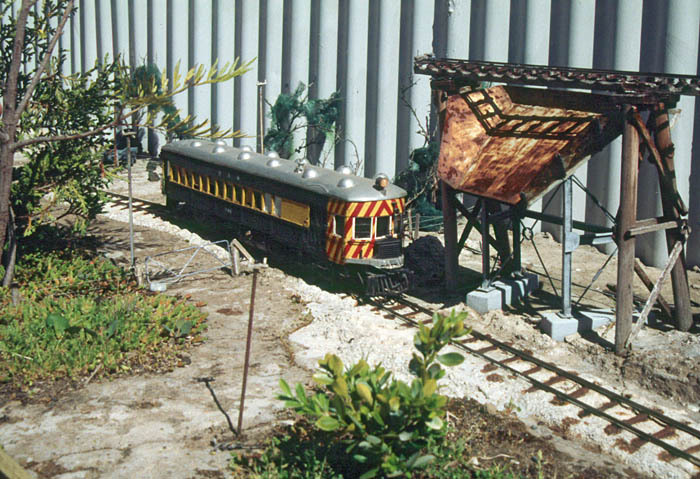 Below: Brill Model 75 railcar 105 rattles past the loading chute at Ningana Quarry, and at Tuluna Downs homestead. The line in this area will disappear with the rebuilding. Above: Yx141 rumbles across the Warrunda Creek bridge (the model is considerably higher than any bridge on Eyre Peninsula). T45 draws to a stop at the Warrunda Creek water column. 'New' Yeelanna will occupy this site. An overall view of 872 and its train at Yeelanna.